If you are looking for a French city which can definitively compete with the lovely capital city that Paris is, I think you should opt for the beautiful and affordable – but no quality loss – Lyon! More than simply listing the most famous monuments or places from the town, I thought about sharing my very own personal travel bucket list, with all of my favourites to help you to discover other sides of the city. Situated 290 miles from Paris, 200 miles from Marseille, 260 miles from Strasbourg, 100 miles from Geneva and 170 miles from Turin, Lyon has seized the opportunity offered by its central location. Third biggest city of France in terms of population, its economy is the second ‘healthiest’ in France. Lyon is a major centre for banking, chemical, pharmaceutical and biotech industries, not surprising that its population is booming! The city is within easy reach from every major European city, given that it has a well-connected airport 25 km east of its centre. 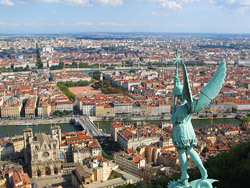 After considering both Lyon and Paris, I chose to study in Lyon. This was because I was planning to spend several months in France, and I wanted to be in a big city, but I felt that in Lyon I would have more opportunity to speak French and experience real French culture than in Paris. 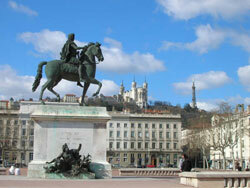 What I discovered was that Lyon has so much more to offer than this! Beautiful Lyon lies on three rivers. 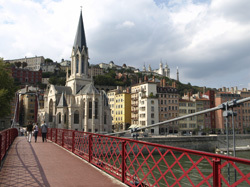 The masculine Rhône and the feminine Saône divide the city into distinct districts.